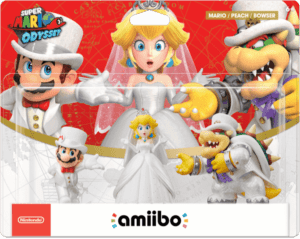 The Wedding Outfit amiibo figures for Super Mario Odyssey are revealed! Here are some of the bonuses that these amiibo figures give in the game. Ahead of the release of Super Mario Odyssey for the Switch, Nintendo released information about the new amiibo figures connected to the game. There amiibo games figures feature Mario, Princess Peach, and Bowser wearing what seems to be wedding outfits. The wedding theme is one of the most crucial aspects in the game, as the entire story revolves around Bowser marrying Peach by force with Mario trying to stop the wedding. The figures have Mario, Peach, and Bowser dress in all white, but with accents of gold, red, blue, purple, and silver. Mario (Wedding Outfit) – Grants temporary invincibility. Gives Mario the Wedding Suit. Princess Peach (Wedding Outfit) – Gives a Life-Up Heart. Unlocks the wedding dress for Peach. Bowser (Wedding Outfit) – Reveales the location of regional coins. Unlocks the wedding suit for Bowser. Some of the bonuses given by these figures are very useful. For instance, you need the Bowser figure to locate some regional coins that you haven’t found before, making it easier to collect them if you want to complete the game to 100%. Besides the new figures, players can also use all the existing and previously released figures in the game. Some amiibo figures give Mario outfits while some will give bonuses similar to the new Odyssey figures. However, all outfits in the game can be unlocked even without the help of the figures. So you don’t have to buy all the figures to get an advantage in the game. Super Mario Odyssey and the Wedding Outfit amiibo figures are releasing on October 27, 2017. Odyssey is coming out exclusively for the Nintendo Switch.